The World Wide Web is powerful. Knowledge is power, and there is everything and anything available on the internet. Thirty years ago, a customer was limited on how they got their information from dealers. They had to look in the newspaper, call, or visit the dealership. Fifteen years ago, an automotive customer could to go to the library or a bookstore to find a book on trade values or look up invoice prices. The information was more difficult to find and car sales people had an easier time—because they held the information. Now days, information is at a customer’s fingertips. They don’t have to leave the comfort of their living room or office to get everything from the average transaction price to trade values. They can look up interest rates from competing lenders or credit unions and communicate with eight dealers from their cubicle, home, or smart phone. Dealerships no longer hold the information. More and more shoppers are doing everything online. It is said that by the end of 2011 over 90% of customers will have at least done some preliminary shopping online. But the dealership has the vehicles on their lot. A customer still has to contact the dealership, get their trade appraised, and take delivery at the facility. How is your dealership prepared to handle the internet customer? What are you doing on a daily basis to contact, follow, track, and get that internet shopper to come into your dealership? Does your process stop with setting the appointment and getting the customer in the door, or does it incorporate all areas including the steps to the sale and prospecting? Automotive Internet Sales Mastery is a complete guidebook for handling today’s customer effectively and efficiently. It has a step by step process for contacting and following your online customers and converting more of them to appointments. It incorporates a simple step-by-step Road to The Sale process for those Internet departments who take the customer all the way through to the delivery. The proven scripts, word tracts, skills, and e-mail templates will take you from being average in internet sales, to conquering cyberspace! 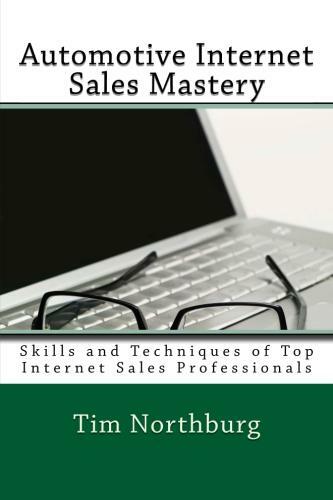 You too, can master Internet Sales. So, use these skills and techniques to SELL MORE VEHICLES! In dealerships today, Internet Departments are growing and many dealerships are going to an all Internet based sales force. What processes do you have in place to handle your Internet customers to appoint and close more leads? Automotive Internet Sales Mastery is your complete guide to handling, appointing, and selling more Internet customers. This step-by-step guidebook takes you through the first call, the first text, and the first e-mail. It outlines a rigorous 90 day follow-up, breaks down the Internet sales process, and more. Become an Internet Sales Master and sell more vehicles! Tim Northburg started his automotive career in 1996 selling at a Saturn retail facility where he learned highly valuable customer service and needs based selling skills. In 1998 he gained international experience while managing a Rover, MG, MINI Cooper dealership in Chester, England. Since 2000, he has moved into upper management where he currently trains, motivates and leads his highly successful team of sales professionals. He has three years experience running the Business Development Center where he learned valuable customer follow-up, incoming phone call, prospecting, and owner retention techniques and skills. He spent six years as a Used Car Manager /Desk Manager and is fully trained in Finance, Marketing and Public Relations. In 2010 he became a Sales Manager and E-Commerce Director at a highly successful Honda, GMC, Buick Dealership. Tim Northburg’s commitment and dedication to the business, and the sales people he leads, is evident in this complete training guidebook. He shares the knowledge gained, throughout his career, because he wants others to succeed like he has.